It's a recipe for disaster when bookbinder Brooklyn Wainwright is asked to restore an antique cookbook . Brooklyn has always been a little obsessed with food, but it was her sister Savannah who became a chef, graduating from the prestigious Cordon Bleu school in Paris. She and her classmates all went on to successful careers, but none of them achieved culinary superstardom like Savannah's ex-boyfriend Baxter Cromwell. When Baxter invites the old gang to participate in his new restaurant's gala opening in San Francisco, Savannah looks forward to seeing her friends, and even asks Brooklyn to restore a tattered cookbook an old gift from Baxter as a present for him. But Brooklyn immediately recognizes that the book, which has strange notes and symbols scrawled in the margins, is at least two hundred years old. She thinks that it probably belongs in a museum, but Savannah insists on returning it to Baxter. Shortly after receiving the gift, Baxter is found dead, with Savannah kneeling over him, bloody knife in hand, and the rare cookbook has disappeared. 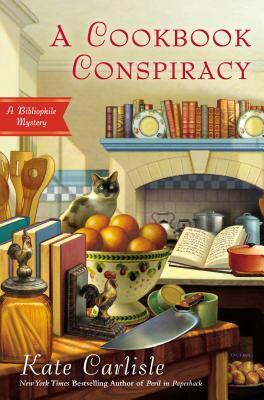 Brooklyn knows her sister didn t kill him, and she suspects the missing cookbook might lead to the real villain. Now Brooklyn will have to turn up the heat on the investigation before Chef Savannah finds herself slinging hash in a prison cafeteria. A native Californian, "New York Times "bestselling author Kate Carlisle worked in television for many years before turning to writing. A lifelong fascination with the art and craft of bookbinding led her to write the Bibliophile Mysteries featuring Brooklyn Wainwright, whose bookbinding and restoration skills invariably uncover old secrets, treachery, and murder.